During a steel cutting ceremony MSC Cruises has revealed the name of its largest ever cruise ship as MSC Meraviglia. Known as the “Vista Project” until today the MSC Meraviglia will be the largest ship ever built for a European based cruise line and only Royal Caribbeans Oasis class vessel are bigger when it comes to passenger capacity. The announcement was made during the vessel first steel cutting at the STX France shipyard in Saint-Nazaire. The cutting is a major milestone and begins the physical construction process of the vessel. 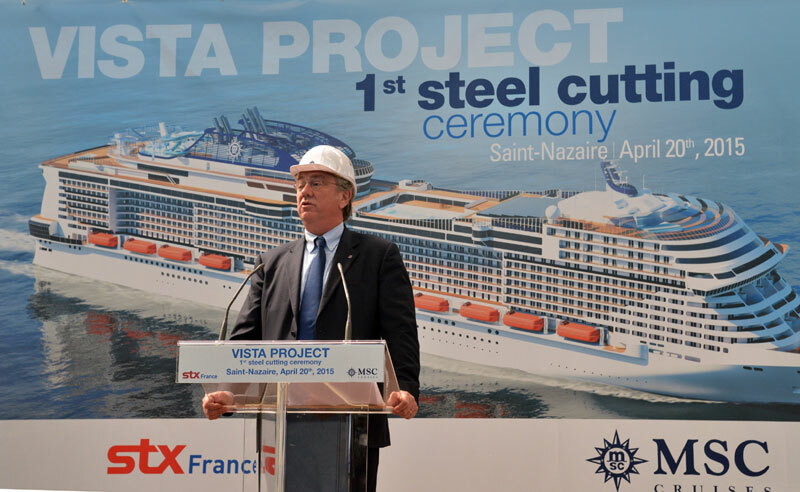 At the steel-cutting ceremony, MSC Cruises Executive Chairman Pierfrancesco Vago told assembled press and dignitaries that the cutting-edge 4,500 guest (double occupancy), 167,600 gross ton ship due to be delivered in May 2017 and open for bookings from June 2015 will be named MSC Meraviglia. She will spend her first summer sailing the western Mediterranean, and will be the first to have three homeports: Genoa, Marseille and Barcelona. Some new details have also been released with new specially crafted ‘cluster cabins’ for families, and an extended MSC Yacht Club, the wholly self-contained luxury area on the prestigious foredecks, which will be enhanced with duplex suites, a vast solarium and a private lounge and restaurant. The cabins will give groups the chance to open up 3 cabins into 1 making the experience even better for cruisers. There will also be a large theatre and a spectacular amusement park linked to an outdoor aqua park, as well as a three-deck interior promenade. The cruise line is also following Royal Caribbean with new technology advancements where guests can use their cruise card, bracelet or smartphone to make onboard payments, access their staterooms or geo-locate children. The main promenade deck that is usually a hive of activity on cruise ships will feature a huge 5,167 square foot LED screen. The screen will cover the entire ceiling displaying breathtaking visuals that will set the atmosphere throughout. 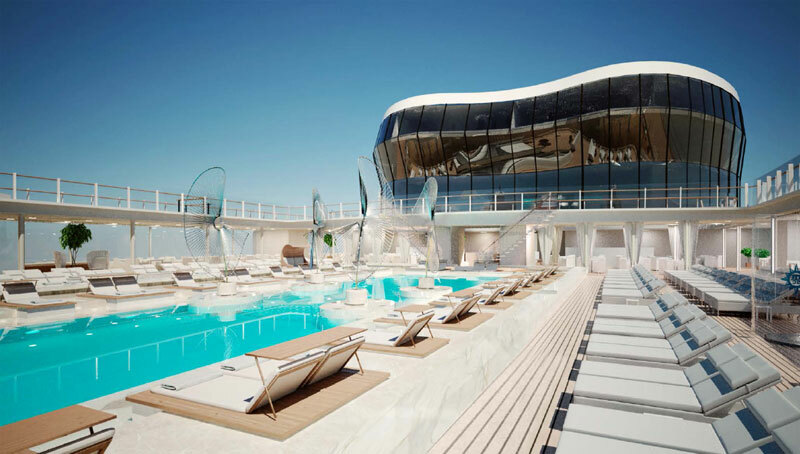 The environmentally friendly cruise ship will be the first of two to be built by the shipyard and will take MSC Cruises into the future as one of the worlds fastest growing cruise lines. The 167,600 gross ton MSC Meraviglia will be completed by May 2017 with a second Vista Class ship to enter service in 2019. The cruise line also has an option to build another two Vista class vessels to be delivered by 2022. MSC Cruises also has two new generation Seaside cruise ships that are being built by rival shipbuilder Fincantieri.